FR100 "BLACKOUT BUDDY" AC PLUG-IN POWER FAILURE LIGHT AND AM/FM RADIO! The Blackout Buddy is the essential emergency tool for every home. 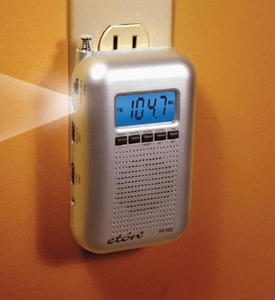 Designed to stay plugged into the wall for continuous charging and to be ready for any emergency, the Blackout Buddy's built-in LED light and AM/FM radio automatically turn on when the electricity goes out. The rechargeable battery provides enough power for hours of emergency AM/FM radio and light operation: 12-16 hours of LED light use, or 4-8 hours of radio use. The Blackout Buddy also serves as a convenient and functional everyday plug-in radio and light for any room in the home or office. Consider multiple units for different floors of your home. Dimensions: 3"W x 5"H x 1.4"D Weight: 10 oz.